#irishsailingfoundation – A new Irish Sailing Association (ISA) organisation called the 'Irish Sailing Foundation (ISF)' expects to build 'philanthropic fund raised income to €2.75 million annually in support of the high performance mission and programmes'. 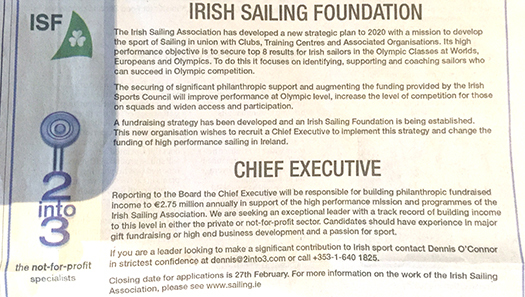 The new organisation is seeking to recruit a Chief Executive that is 'an exceptional leader with a track record of building income' to change the funding of high performance sailing in Ireland. 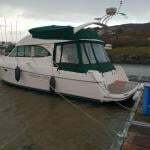 The Irish Sailing Association recently published its new strategic plan and it is currently meeting sailing clubs from around the country to outline details of the plan. After a period of controversy over association policies, the new plan outlines a vision for sailing until 2020 and confirms sailing as the third best supported sport by Irish Sports Council. A main change proposed for the ISA in the plan is an 'emphasis on upgrading the support structures for sailors not involved in the ISA High Performance'. The plan refers to the development of 'professional fund-raising' for its high performance team but it does not refer specifically to the set up of a new organisation nor does it refer to the 'Irish Sailing Foundation'. As Afloat reported previously, the recruitment advertisement for the ISF's new CEO was advertised in last Friday's Irish Times and across Sunday national newspapers too. It is also posted on the association's website. The high performance objective is to secure top 8 results for Irish sailors in the Olympic Classes at Worlds, Europeans and Olympics. 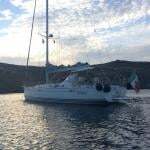 To do this it focuses on identifying, supporting and coaching sailors who can succeed in Olympic competition. The advert says 'securing of significant philanthropic support and augmenting the funding provided by the Irish Sports Council will improve performance at Olympic level, increase the level of competition for those on squads and widen access and participation'. More details and a copy of the advert for download is available here.